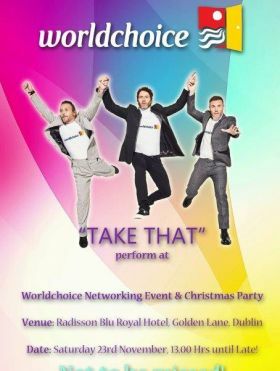 “Take That” (Tribute) to headline at Worldchoice Networking Christmas Party. Worldchoice are delighted to announce their Trade Partner Networking Event and Christmas Party which will take place at the Radisson Blu Royal Golden Lane in Dublin on Saturday 23rd November from 1.30pm til late. Carol Anne O’Neill (Worldchoice Commercial Manager) said, “We are delighted to have Gary and the boys perform at this year’s networking event and Christmas Party. We have a fun day planned alongside our business agenda and we do hope that all of our members and trade partners will join us on the day. I will be sending out further information about the event in the coming weeks but please save the date in your diaries”.